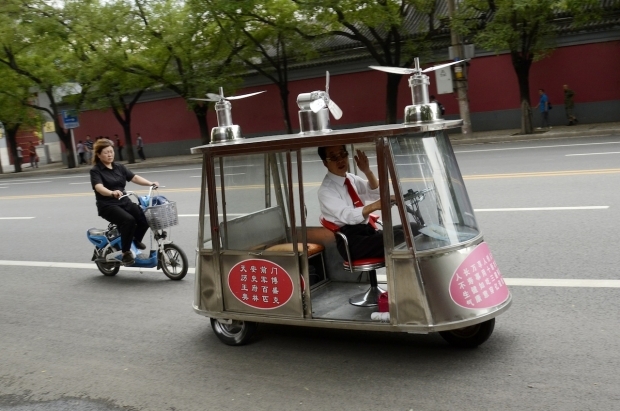 A man driving his self-designed electric vehicle in a Beijing street on September 2, 2012. China’s leadership says it hopes to boost the economy by accelerating reforms and fostering innovation. In China, innovation has become one of those political buzzwords which—like harmony—seems to mean anything and everything to the Central Propaganda Department. So much so that we find it difficult to walk down the streets in Beijing now without getting accosted by giant character banners encouraging us to economic feats of creative daring. But how much of what passes for innovation in China is actually the least bit innovative? To help Sinica answer this question, this week Kaiser and Jeremy are pleased to be joined by Tom Saunders, a researcher and policy analyst at the Nesta think-tank on innovation who is in Beijing as part of a high-level British delegation focused on strengthening economic ties with China. More importantly, Tom is also the author of a recent report “China’s Absorptive State: Research, Innovation, and the Prospects for China-U.K. Collaboration,” which tries to make sense of how much innovation in China is genuine, and what this means for the rest of the world.